Unnatural Field Recordings: Tokyo is part one of a series of compositions which incorporate unnatural field recordings, sine tones, recordings from no input mixer, digital timers, and amplified objects. Each composition is unique, and allows space for real-time composition within the score. Unnatural Field Recordings are recordings comprised of man-made, digital, analogue, and mechanical sounds, as well as many other incidental sounds, which make up a city's soundscape on metros and in public spaces. The palette of sounds is ever changing, and include recordings from various cities including: Istanbul, Mexico City, Shanghai, Berlin, Vienna, Prague, etc. 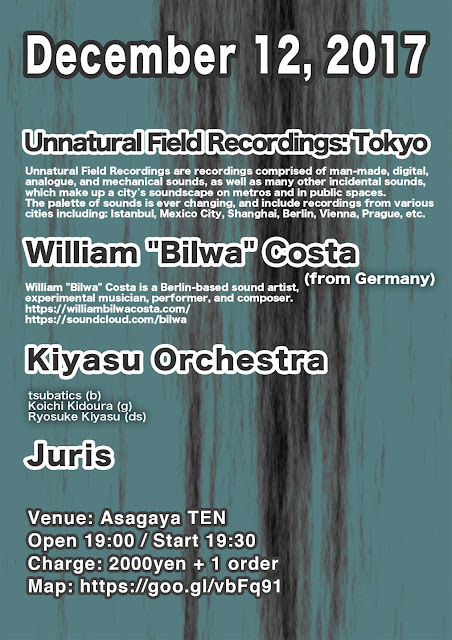 William "Bilwa" Costa is a Berlin-based sound artist, experimental musician, performer, and composer.